I nstalling a Pet Door is easy if you have the right tools and the right pet door. High Tech Pet Offers a complete line of dog and cat doors for quick, easy installation in doors, walls, sliding glass patio doors, even windows and French doors. Here we provide you with general DYI instructions for self-install of a doggie door in doors, walls and sliding glass doors. You can use the instructions to install a cat door just as quickly and easily. 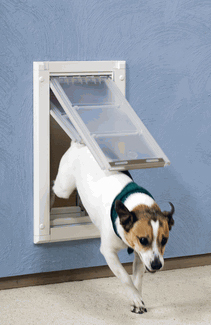 Before purchasing your new pet door you need to figure out the right size and installation type of doggy door. Pet door manufacturers such as High Tech Pet, Ideal, Petsafe and others classify there pet doors into small, medium, large, extra-large and sometimes super-large sizes. Cat doors usually come in standard "cat flap" or larger hefty cat sizes. For the very "well fed" cats, a small dog door size may be more suitable. To determine the door size, first determine the minimum flap size. Do this by making the following measurements on your doggie. Measure the widest part of your dog. Usually, this will be the width across the shoulder. Add 2" to this measurement. This will be the minimum flap width you need. Next, Measure the distance from the top of your dog's shoulder blades to the belly. Add 3". This will be the minimum height of the flap you need. Select the size doggie door with a flap that has both its width and length measurements greater than your corresponding minimum width and length requirements. Your choices are door installation, wall installation, installation in a sliding glass patio door, garage door, screen door or window. When installing in walls, it's best to use the manufacturer's wall installation kit. If the manufacturer does not provide this as an option, we suggest you chose another model that does unless you really love the particular doggie door and you are sufficiently skilled to build an interior frame to seal off the hole you will be making in your wall to install the dog door. Measure the height from the floor to the top of your dog's shoulder blades. Add 1" to determine the mounting height of the top edge of your doggy door. When installing in a household door, you may find it desirable to remove the door from its hinges and lay it on saw horses when cutting the opening and installing the dog door. For installation in steel doors or other types of metal doors, we recommend you have it done by a pet door installation professional. Many doggy doors come with a paper template included. If there is no template included, you can use the lock out slide panel as your template. Cut the template out. On your household door, measure from the bottom and place a mark at the mounting height dimension and draw a horizontal line. Place the top of your template on the line and tape it in place. Mark an X at each of the four corners. If there are holes for mounting screws shown on the template, mark those holes too. With your pencil and straight edge, draw a straight line between each corner hole using the outside diameter of the holes. Now, use your jigsaw or circular saw to cut out the opening. With the jigsaw start at one corner. Insert the blade into the hole and cut along the line to the next hole. If you are using a circular saw, start at one corner just below the hole and cut along the line to the next hole. Continue at each corner hole until the opening is cut out. On the exterior surface of your door, insert the pet door's outer frame into the opening. Fasten in place with mounting screws if required. From the interior side of your household door, use calk to seal all around the outer frame. On the interior surface of your door, insert the pet door's inner frame into the opening. Fasten in place with mounting screws. If you chose to remove your household door for this installation, remount the door on its hinges. On the interior wall locate the wall studs in the area where you will be mounting your pet door by tapping or using a stud finder. The doggie door must go between these studs. You must be certain there are no electrical wires, water or gas lines between the studs in this area. Measure from the floor to the top mounting edge using the mounting height dimension you determined above. Draw a horizontal line to establish the top mounting edge. Cut out the manufacturer's paper template, Align the top edge of the template with your line and, using your pencil and straight edge, trace the opening. If no template is provided, use the pet door's lock out slide panel as a template. Now, use your jigsaw or circular saw to cut out the opening in your drywall. Start at one corner. Insert the blade into the hole and cut along the line to the next hole. If you are using a circular saw, start at one corner just below the hole and cut along the line to the next hole. Continue at each corner hole until the opening is cut out. When all 4 cuts are made, remove the cut drywall. Remove any insulation or other matter between the studs. Make sure there are no electrical wires, gas or water pluming that will interfere with your dog door installation. Working from the inside wall mark an X on the inside of the exterior wall corresponding to each corner of your cut-out. These will be the corner points of your exterior wall cut-outs. Drill a hole at each mark. 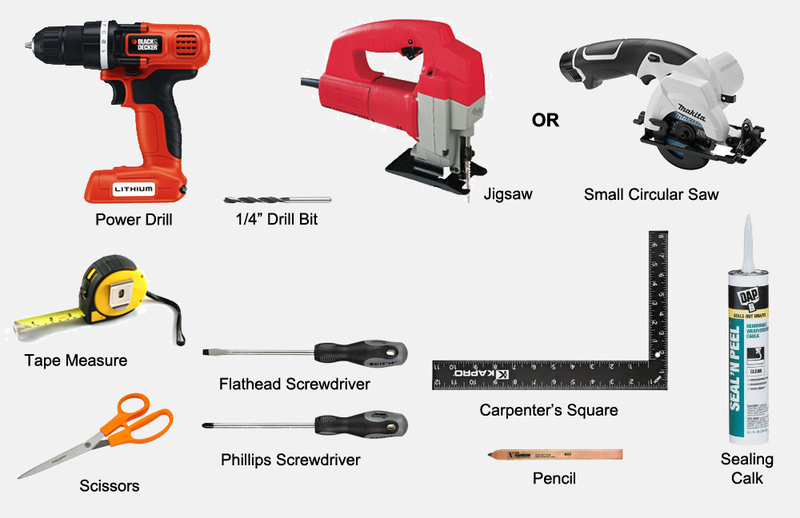 Note, if you are drilling through stucco or masonry, you may need to use a masonry drill bit. Working from the outside of your home, make lines between each drilled hole. With your circular saw and masonry blade cut along the lines from hole to hole. When completed, remove the cut wall material and clean debris from the inside. Using the manufacture's template, drill all mounting holes using the manufacturer's recommended drill bit sizes. If you do not have a template, use the frames containing the mounting holes as a template. Drill all holes in internal and external walls. Hopefully, the manufacturer provide a wall installation tunnel with the doggie door. If so, skip to Step 9. If not, you will need to build an inner frame to seal off the opening using plywood or 2 X 4 lumber. The frame should fit snuggle between interior and exterior walls. It should be caulked to prevent moisture entering between your wall studs. Install the outer pet door frame by inserting into the exterior opening and securing with screws in each mounting hole. If the manufacturer provided a wall tunnel, now is the time to install it by fitting it into the outer dog door frame. This should be done from the interior wall. Install the inner doggie door frame. This is usually the one containing the flap. Fit the inner frame to the wall tunnel and secure it to the inside wall by inserting a screw into each mounting hole. 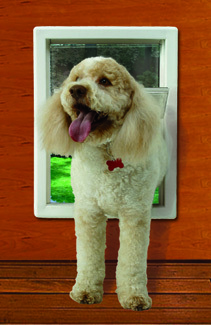 Start by purchasing one of our great, easy to install patio pet door inserts. These pet door inserts include the pet door of your choice mounted in our preassembled tempered glass inserts that drop right into your sliding glass patio door frame. They included weather stripping and a draft stopper for an air-tight, beautiful looking patio pet door installation. Some of our patio pet doors come with dual pane e-glass for the ultimate in energy efficiency. Insert the pre-made glass panel onto the track of your sliding glass door. Release the spring loaded top with the 2 thumbscrews and it automatically adjusts itself to the height of your door. Push the panel against the inner wall and tighten the thumbscrews. Carefully peel and apply the weather stripping along the edge of the POWER PET door to provide a seal between the POWER PET door and the sliding glass door. Apply the draft stopper to the back of your sliding glass door. Before mounting the locking mechanism, remove any screws that might obstruct attachment on your sliding door. Position locking pin as low as possible on the edge of the sliding door while still being able to push and pull the pin for locking and release. Mark where a hole should be drilled in the stationary sliding door to accept the pin when the sliding door is closed tightly against the PX-SGL Pet Door. Drill the hole first using a 1/8 inch drill bit and then finishing with a 1/4 inch drill bit. (Figure 6) Be careful to not penetrate the drill bit beyond the frame material (aluminum or PVC). Drilling too deep may damage the glass or the glass seal. Drill just deep enough to create a 1/4 inch hole for the pin to engage. Insert the lock pin in the drilled hole and hold the lock in position while you mark the two mounting slots on the edge of the sliding door. (Figure 7) When doing this, position the lock so that it will not interfere with anything while opening and closing the door. Remove the lock and using a 1/8 inch drill bit, drill pilot holes for two screws to hold the lock to the sliding door. Drill only deep enough to produce a hole in the sliding door frame. Drilling too deep may damage the glass or glass seal. Position the lock with the pin extended into the 1/4 inch hole, and fasten the lock to the door using two supplied self-tapping screws. Operation: Pull the pin to allow opening of the door. Close the door and push in the pin to lock the door closed. High Tech Pet makes and sells the best pet doors on the planet. 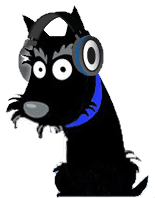 Below you will find a great selection of doggie doors and cat flaps that can be door mounted, wall mounted, installed in sliding glass, windows, storm doors and screen doors. These high quality pet doors provide a high level of home security while giving your dog access to his own personal doggy door. If you have problems with raccoons or stray animals the perfect solution may be our amazing Power Pet door. For a lower tech and less expensive option, the Ideal Pet Products, Ruff Weather Door gets our recommendation for use in extreme weather. 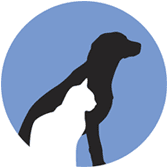 Note that we do not carry doors made by Petsafe, Solo, Plexidor, Hale, Johnson Pet Doors, Staywell, Pride Pet Doors or Dog Mate. These doors may be fine for some applications but we choose to offer our customers the best dog and cat doors at the best value. You can purchase any of our superior quality doors right here on this website and receive same day shipping, with the industry's best warranty and return policy. You may also purchase any pet doors made by High Tech Pet online from Home Depot, Lowes, Petsmart, Petco, Walmart or Sam's Club. 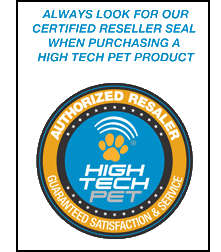 No matter where you buy it, if it�s a High Tech Pet product you are guaranteed satisfaction and the best product, best customer service and support to be found anywhere.